Upon completion of the NIPTE Certiﬁcation Program, participants will be able to bring these core competencies together in a comprehensive, integrative approach. Examine quality systems, standards, and their impact on public safety as well as the reliance on quality by health care providers. Obtain and apply broad knowledge of FDA and international law, regulations, and guidance documents for at least one category of medical products (drugs, biological products, devices). 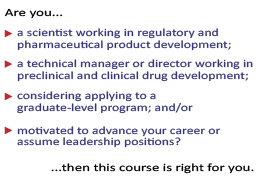 Obtain and apply broad knowledge of FDA and international requirements for the approval and conduct of pre– and post–market clinical studies with regulated products and understand the basic principles of clinical study design and clinical data analysis for at least one category of medical products. Recognize the factors that inﬂuence regulatory decisions. Develop methods to incorporate regulatory trends and practices. Think strategically about product development and marketing. Develop critical thinking and interpretation skills. Synthesize information and draw logical conclusions, provide support of arguments and recommendations. Display professional behavior and understand strategies to address ethical dilemnas. Demonstrate values consistent with provision of quality health outcomes. Certificate holders become part of a larger community of active learners, engaged in identifying needed competencies and embracing training as a driver for success. This community of knowledge will be the first to know about program updates, refresher courses and other educational opportunities. Copyright © 2019 NIPTE | Education & Certification. All Rights Reserved.